Compared to the large, expensive, and technical ISO documents from Geneva this dictionary provides information on SI (metric) units in a clear, interesting and non-technical way, it is good value. 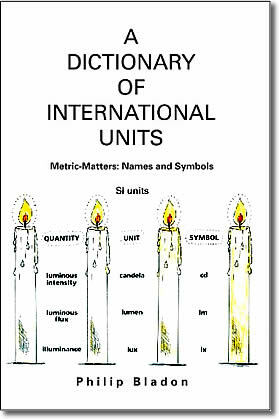 International Units and their symbols - an international language. A new handy book that's becoming a standard reference work on SI (metric) units, it explains things clearly in an interesting and non-technical way. It's not just a reference book for High School science students; Primary, and Junior School teachers around the world are also are using it. A section of this small handy book provides a simple guide to writing metric names and symbols correctly.